Prof. Dr. Muhammad Ashraf, Chairman PSF visited Turkey for participation in the “IOSTE Eurasia Regional Symposium & Brokerage Event Horizon 2020”. 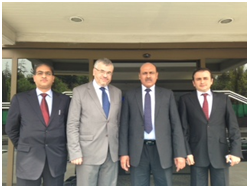 He also visited the Turkish Cooperation and Coordination Agency (TiKA) on April 28. Dr. Mirza Habib Ali, Focal Person of PSF for International Linkages accompanied him. 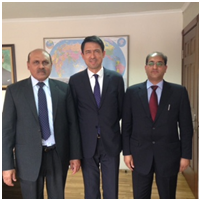 They held a meeting with Dr. Rahman Nurdun, Head of Department East and South Asia, Pacific and Latin America, TiKA, Turkey. Both the sides briefed each other about programs of their respective organizations and thoroughly discussed various areas of collaboration. 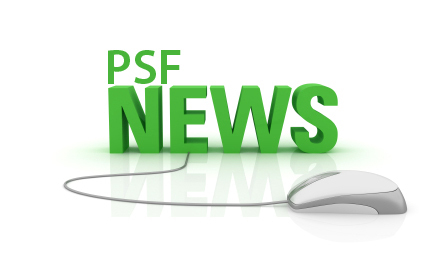 Dr. Rahman Nurdun said Head of TiKA Pakistan will soon visit PSF to discuss various ideas that can be materialized for country-based projects. He showed keen interest in launching joint projects in Northern Areas of Pakistan to uplift socio-economic conditions of the common man. They also discussed a joint project titled “Pilot Scale demonstration and popularization of dual technology of Bio-Geyser with agro-waste compositing” to overcome sever energy crisis in Pakistan.